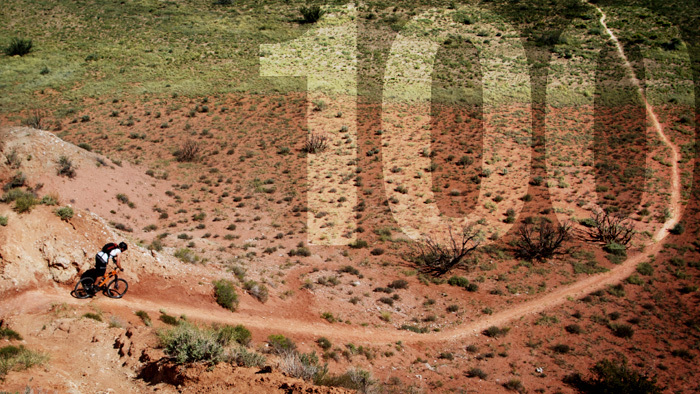 Riding your mountain bike 100 miles is a big challenge to your body, mind and equipment. Of course you’ll need to put some long hours in the saddle to be prepared, but don’t let a last minute issue ruin your day. Study up on these top ten tips to make your day a successful one. Read the entire race website to learn the logistics. Get the start location, day and time right. Learn about any surprises your goal race may have. The unexpected can trip you up, such as the race starts in the dark and a light is highly recommended or you can’t park at the start line. Determine how many aid stations and what services such as drop bags are at your disposal. Line up the details of where and when you will leave your drop bag and be reunited with it. Create a calm, organized race morning by preparing everything you need for your race the day before. Fill your bottles and hydration packs, stock up and label your drop bags, lay out your clothing, pre-make your breakfast, and prepare your bike. Put your number plate on your bike and attach the timing chip to your stem. These are two items that will create panic if they are at your back at your condo instead of with you on the start line. The magic food for a 100 mile MTB pre-race breakfast is the one you are used to, have eaten many times, know will digest well, and fuel your race. Eat nothing new or fancy. This meal should consist of mostly carbohydrates with a little fat and protein and be eaten over two hours in advance of the race start. A good pre-race breakfast is a cup of coffee, glass of water, white rice, and scrambled eggs with some salty tasty additive like ketchup or salt. Another option is a liquid breakfast of a fruit smoothie with some coconut oil and protein powder. The liquid option can be easier to get down the hatch in the early pre-dawn hours required before an endurance race start. Look up the high and low temperatures for the day and dress for both. Wear layers you can remove or vent without stopping once warmed up. A jacket or vest that unzips and arm warmers that easily slide down your arms are good options. If it is going to be a scorcher, dress in light colored clothing to stay cool. If there is a high potential for rain, start with a jacket or have one available in a drop bag. The goal is to have a fairly even pace over the entire 100 miles. To pull this off you need to start at a speed that feels conservative, then increase your perceived exertion gradually as start-line excitement wears off and fatigue sets in. Start at the speed you have trained yourself to maintain. Starting faster than you have trained to do is the biggest mistake to make in a 100 mile mountain bike race. Early over-pacing leads to muscle cramping, premature fatigue and the inability to fuel. If you are riding too fast to drink or eat in the first hour you are over-pacing. Fuel in + energy out = fast happy 100 miles. This is the formula you are looking for. Engines need fuel to run and yours will sputter and fade without enough. Guidelines for fueling a 100 mile mountain bike race are: every hour take in 60-90 grams carbohydrates, 18-24 oz. fluid, 400-700 mg sodium and 100-300 mg potassium. Frequently consume, in small amounts, any combination of water, sports drinks, gels, fruit, energy bars and electrolyte capsules to achieve these targets. Find your groove once race traffic eases up about an hour after the start. Settle into your go-all-day pace and focus on efficiency and fueling. Stand up briefly to stretch your back and give your rear a break at regular intervals. Consciously admire and relish the performance your body is producing after months of training. During the early miles of the race, pedal with your cadence on the high side of your efficient cadence range. This puts more stress on your cardiovascular system than muscular system and saves your legs for later in the race. As fatigue sets in, allow your cadence to gradually drop. Mash your way up the last climb if that gives you the most power but always spin your way up the first climb. Mile 60 is when you feel the fatigue accumulate and need to dig deeper to stay on target and achieve your goal. This is when it gets hard and separates out the tough athletes. Hundies are meant to be hard. As the famous author of Finding Flow, Mihaly Csikszentmihalyi says, “Flow experiences provide a flash of intense living against the background of everyday life.” At mile 60, welcome the increasing intensity of your experience and know this is what you signed up for. Rise to your challenge. Use mind over matter techniques. Sweet talk yourself into smiling instead of feeling the pain. Chant repetitive and rhythmic mantras or songs in time to your pedal stroke. Focus on your goals and take no excuses from that little devil on your shoulder. Be the toughest competitor out there. Start smelling the barn at mile 90 and go for it. Drop the hammer and pick up the pace. Chase everybody in front of you like a rabid dog. Add some caffeine to your fuel source, tell yourself you are a rock-star and get pumped! Spend all the energy you have, all the way across the line. Finish with verve and a fist pump!